South Essex Spring is in the air! Spring is here! The temperature is warming up and the birds are starting to sing, listen out for Chiffchaff and Blackcap singing across all our reserves, they are some of the first migrants to arrive back in Britain. Elsewhere, highlights have included a brief visit from a Little Gull on Vange Marsh amongst the Black-headed gulls on the 23rd March, and on West Canvey Marsh, an Iceland Gull was seen on the 26th. Avocet numbers have been on the increase with a peak count so far of 37 on Vange Marsh. Keep an eye on the skies too, the warm weather is great for spotting raptors, look out for Buzzards and Marsh Harriers making the most of thermals to soar overhead. As things get warmer it’s not just the birds that start to appear, butterflies have been enjoying the sunshine, and so far Brimstone, Comma, Peacock, Small Tortoiseshell and Small White have all been seen out on the reserves. Also keep a look out for large bumblebees, queen bees are now out searching for new nest sites for the year ahead. 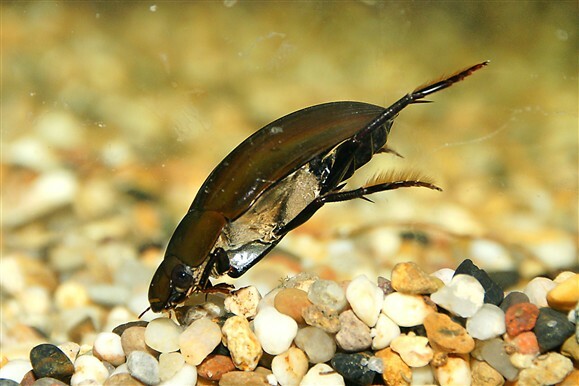 It’s also the time of year frogspawn and tadpoles start to appear, for a closer look why not pop in to our Visitor Centre at Wat Tyler Country Park, and check out our aquarium where as well as the tadpoles you can also see sticklebacks, dragonfly nymphs and of course Sydney the Silver Water Beetle!